Nada Nada Discos do Brazil, after the excellent repress of the Olho Seco "botaz, fuzis, capacetes" ep of a couple of years ago, did it again. 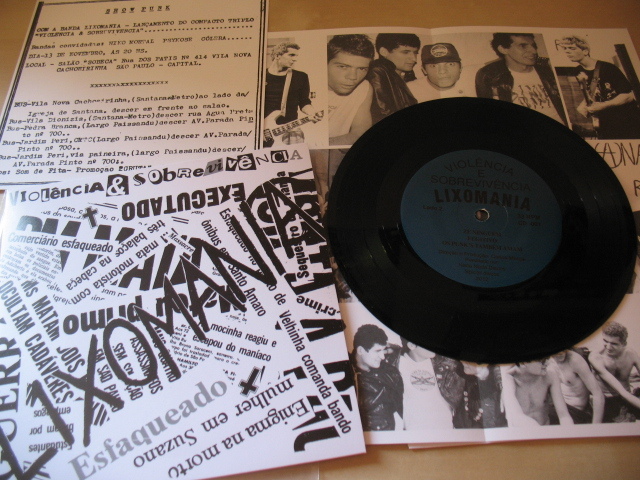 In the last few months they have reprinted both the other two classic brazilian hc eps from the 80s': Inocentes "miseria e fome" & Lixomania "violencia & sobrevivencia" eps. And they did again an excellent work. Both records are perfect reproduction of the originals and, to make things even more interesting, they throw in extra inserts with flyers, brief bios written directly by bands members etc. Label head honchos please take note: this is how reprints should be done. 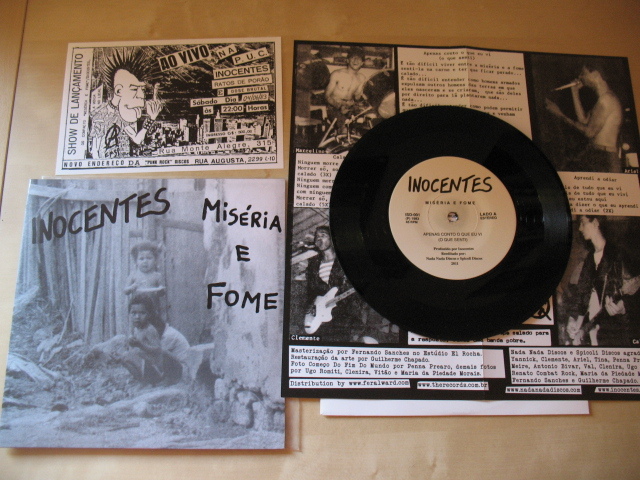 Inocentes had all the ingredients of the classic brazilian sound: political attitude, gruff vocals, downtuned sound and mid paced, catchy but still agressive songwriting. Something similar to Colera but way more brutal! "Miseria e Fome" was supposed to be a 13 songs lp that the band planned to put out on it's own. But in 1983 Brazil was still under a military dictatorship and the censureship didn't allow the release since the lyrics were too political and outspoken. Out of the 13 tracks recorded, they let the band release only these 4 songs with lyrics and titles changed! The full lp finally came out in 1988, few years after the end of the dictatorship. Being a punk in the 80s' in south america wasn't a joke, so Inocentes and the other bands from that era get extra points for being politically active in a not so friendly environment like that!! If Inocentes sound brazilian 'till the bones, Lixomania were kinda unique. Maybe it has to do with the fact that this is the very first brazilian single ever recorded (but not the first to be released). Well, definitely not a bad start! Raspy and aggressive vocals, fuzzy guitars and mid paced drumming and a rough but at the same time catchy production made these six tunes brilliant. Vocals are absolutely their most unique element. Somehow they remind a bit the finnish vox style which wouldn't be a surprise considering that for some unknown reason the first wave of brazilian hc seemed to be deeply influenced by their finnish counterparts. Definitely my fave band from Brazil, too bad this is their unique release! !